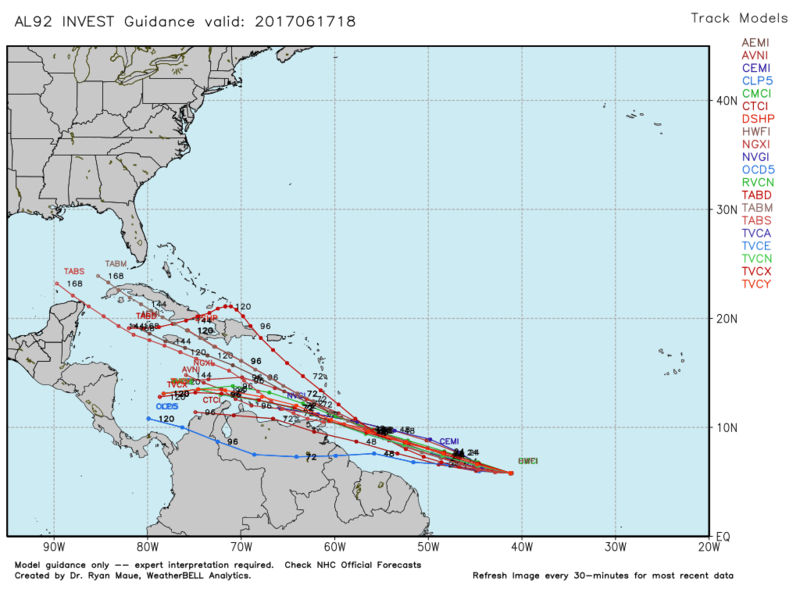 Atlantic hurricane season just started on June 1, but already things look to be "heating up" in the warm waters of the Caribbean and tropical Atlantic - about a month to six weeks earlier than average. 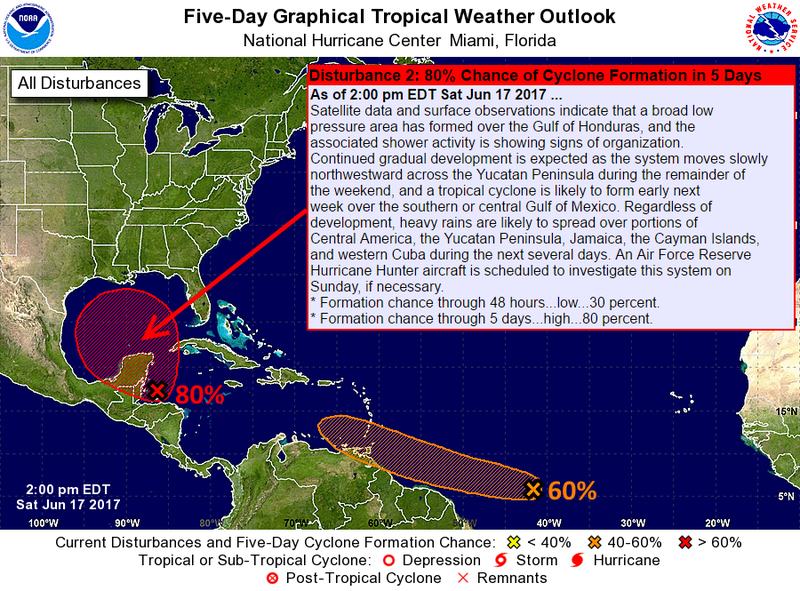 Near the Yucatan Peninsula of Mexico in the southern Gulf of Mexico, home to resorts like Cancun and Cozumel, a large area of low pressure will move northwest across the peninsula with heavy rain and sub-tropical wind speeds this weekend before emerging into the southern Gulf early next week. There is still a large disparity between various computer model solutions on where this system heads once it reaches the Gulf, ranging from the Rio Grande Valley of deep south Texas/northeastern Mexico to the central to northeastern Gulf coast of the United States (think of some of our favorite beaches along the AL/FL coastline or perhaps as far west as New Orleans). In any scenario, it would be late next week before that occurs and none of the models turns "beast mode" on for AL93 (area of investigation #93), but it'll still bear watching! ANd it's also still much too soon to know if it will have any effect on local weather in the Mid-South. If a tropical storm forms from this system, it would likely be called Bret (see 2017 storm names), owing to the fact that premature Arlene formed in the vast reaches of the central Atlantic a couple of months prior to the official start of the season. Sea surface temperatures in the Gulf of Mexico are fairly close to average (within about 1° F, with actual water temperatures near 83° F), though they are warmer than average off the Texas coast. This map from earth.nullschool.net shows sea surface temperature anomalies in shades of red (warmer than average) and blue (cooler than average), as well as ocean currents. The Loop Current is well-established in the southeastern Gulf and the well-known Gulf Stream can also be seen flowing from the Loop Current up the east coast. The position of AL93 is shown and has near average water temperatures ahead of it, unless it heads towards the Lower TX coast. 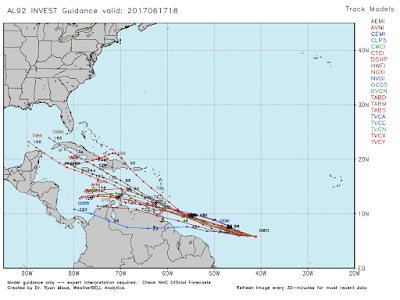 AL92 - Windward Islands and beyond? If the Caribbean system isn't called Bret if/when it develops full tropical storm status, it'll only be because "AL92" in the south-central Atlantic beats it to the punch (see first graphic above)! Moving abeam the northern shores of South America in the next few days, this tropical disturbance seems to have less a chance of development in the long-run, but could be the earliest tropical developments in this part of the world on historical record! 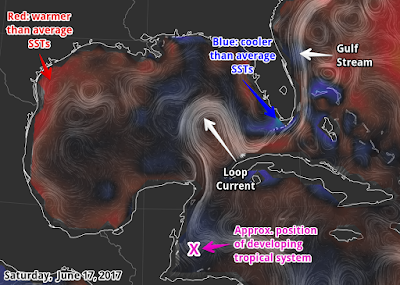 Check out the graphic below, which shows no previous development recorded in the central Atlantic during the middle part of June! There are a couple of interesting items of note that are new for the 2017 hurricane season. 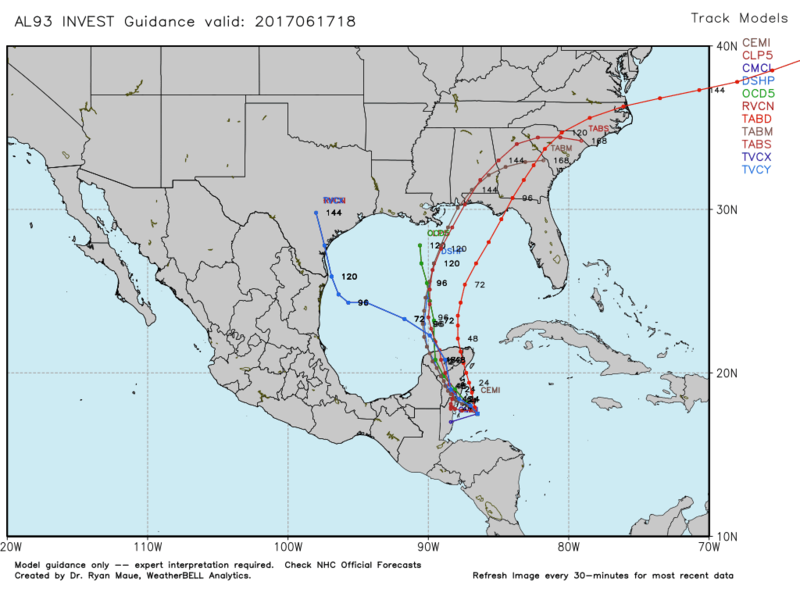 First, the National Hurricane Center will have the option this year to issue advisories, watches, and warnings for disturbances that are not yet a tropical cyclone, but which pose the threat of bringing tropical storm or hurricane conditions to land areas within 48 hours. Previously, a system must have attained tropical depression status for watches and warnings to be issued or NHC advisories to be initiated. Now, a "Potential Tropical Cyclone" can trigger advisories or watches/warnings for land prior to the storm actually officially "forming," thereby allowing more preparation time for those who might be affected in its path (but only if within 48 hours of potential impact to land). 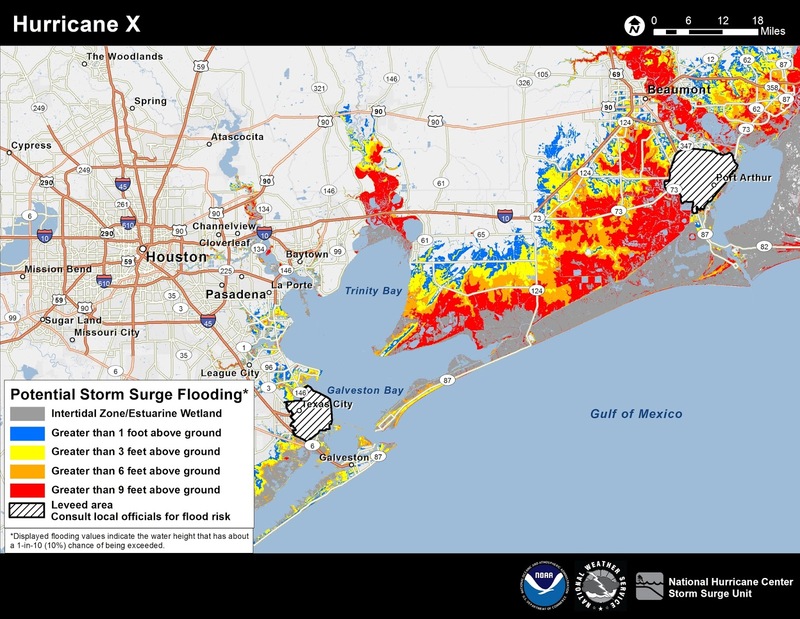 In addition, this will be the first year that Storm Surge Watches and Warnings will be officially issued for tropical cyclones that pose a threat to U.S. soil. This additional warning type will help coastal communities to know about, and respond to, significant water rises above normal tidal levels, another step in alerting impacted communities to the various threats of hurricanes, separate from just the wind speeds expected. To learn more about these, and other new products and services that will be available from the Hurricane Center this year, check out this link. For additional resources during the 2017 hurricane season, be sure to check out MWN's Tropical Page, which we do our best to keep up-to-date throughout the season! Also, StormWatch+ is being updated to include push alerts for Storm Surge Watches and Warnings for coastal areas (remember StormWatch+ works nationwide! ), so you can rest assured that if you visit your favorite beach this year, you will receive all of the pertinent alerts from the Hurricane Center and local National Weather Service office while you are there (as long as you program the alerts for your vacation destination)!